You can read more of Greg's prose and poetry at The Partial Observer. 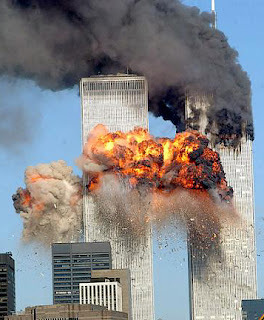 Where were you on Sept. 11, 2001? That’s a question the vast majority of Americans can easily answer. On that unforgettable Tuesday morning I was driving from Naperville to Carol Stream listening to WFMT. Carl Grapentine, the announcer, interrupted the music and read a news bulletin. First reports indicated a small single-engine plane had crashed into one of the towers of the World Trade Center. Subsequent reports brought the fuzzy news story into fearful focus. We were a nation under attack. The magnitude of the tragedy soon became unimaginable. Thousands of lives had been lost. Tens of thousands had been personally impacted. The skyline of New York City had been altered beyond recognition. What was worse, our enemy was unknown. Subsequent attacks were possible. As a result, airports across the country closed down for the better part of a week. Churches opened their doors for spontaneous prayer services. There was a renewed sense of patriotism and dependence on God independent of party lines or religious affiliation. Although the sudden fervor of faith faded as our nation regained its emotional balance, a haunting fear has dogged us for the past decade. National security remains on most everyone’s mind. The increase in terrorist activity overseas, as well as the senseless mass-shootings in our country, has left us feeling vulnerable. The 10th anniversary of Sept. 11 provides us with an opportunity to remember how quick we were willing to turn to God a decade ago. This sad milestone causes us to recall the fragility of life and fleeting nature of peace. It is an invitation to reflect and listen to what our Creator is attempting to say to us in the midst of daily headlines that rob our sense of confidence. We all reflect and listen differently. Some meditate in silence. Some brush paint on an empty canvas. Others journal their innermost thoughts. Still others go on a contemplative walk in nature. My preference is to write poetry. As the anniversary of Sept. 11 approached, I put pen to paper as I was reminded that God holds us securely even when the slippery fingers of our faith find hanging on to hope difficult. God remains our source of courage when we’re traumatized by terror. When we’re haunted by the headlines and the violence everywhere. Hear God whisper in the silence, “Don’t despair, I’m in control. when 3,000 people perished and our hearts were numbed by fear. Yet God whispers 10 years later, “Justice will in time be done. God invites us to be trusting when we find that faith is hard. When we’re fearful for our safety and our nerves are frayed or jarred.